You know that feeling of desperation when you’ve waited too long to eat lunch? 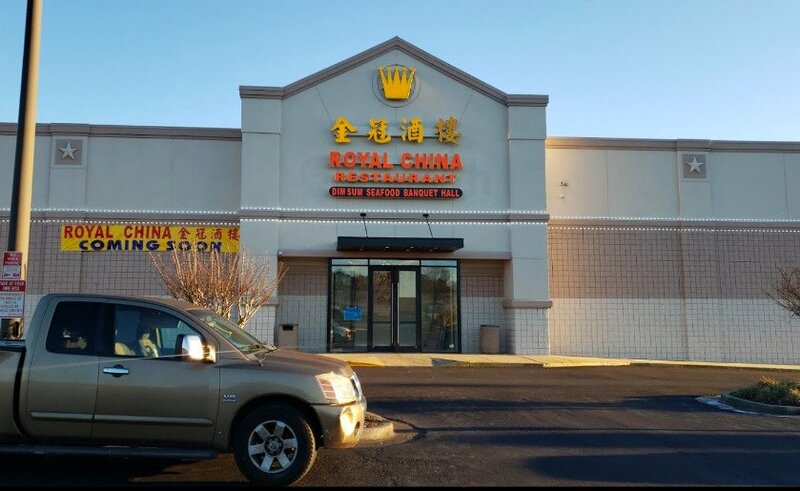 You’re starving and just want something good–and fast. Fast food isn’t an option and the thought of sitting down for lunch gives you a bad case of the lazies. I find myself in this situation at least one a week. 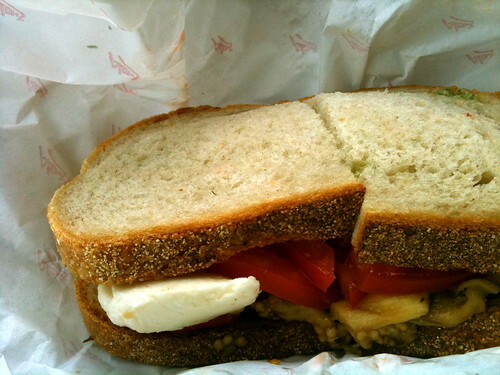 And, when I do, I always end up at Lottafrutta or Alon’s for a veggie sandwich. 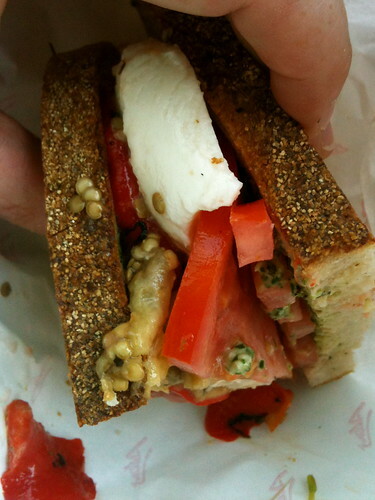 Alon’s is made with loads of homemade pesto, roasted eggplant, roasted red peppers, tomato, and thick slices of fresh mozzarella on your choice of bread–I opted for wholegrain on this visit. The sandwich never lasts long in my lap. I eat half in my car and the other half when I get home. Despite my love for meat, this is one of my favorite sandwiches in Atlanta and typically the ONLY thing I’ll eat at Alon even though the sandwich menu, and other selections have never disappointed when I have dared to be different. Personally for me to tomatoes send it a little over the top and can make the sandwich a little runny; I always get mine without and it seems perfect. The veggie sandwiches at Alon’s and Lotta Fruita got me through my pregnancy. I had a serious meat aversion for 9 months. I also latched on to the panoramic veggie sandwich at Carroll Street Cafe.